Having a free evening and fine weather last night the Countess and I decided to take our copy of Eric Ferrara’s swell new book The Bowery: A History of Grit, Graft and Grandeur and head to that thoroughfare and see what we could see. Of course, nowadays you can’t see anything. Actually that’s not true – there are several august old banks and even some 19th century residential buildings extant along the way. We were focusing on historic show biz venues, however, and of the many that once distinguished the street, the only one that may still partially exist from what I can tell is the structure of Miner’s Bowery Theatre, hidden by a hotel façade put up in the 1920s. But I already knew that to be the case. There’s still a value in seeing where things were. I had done a similar jaunt several years to find the Lower East Side birthplaces of several vaudevillians. Again, everything is gone, but it is useful to use the imagination, and if nothing else, observe the spacial relationships between the various (former) points of interest. I was interested to note in this case that most of the stuff I was after was on the Southern end of the street, south of Houston, and is now strictly Chinatown, and the Electrical Lighting Fixtures District, known by real estate marketing peoples as ElElFaDa (I just made that up). The Bowery Theatre, first known as the New York Theatre, Bowery, built 1826. It was New York’s third theatre and became known for its populist, nativist orientation, providing blood and guts melodramas to the masses. It is also the place where T.D. “Daddy Rice” debuted “Jumping Jim Crow”, launching the craze for blackface minstrelsy**. The location later became the Thalia Theatre, which specialized successively in German, Yiddish, Italian and Chinese theatre, reflecting the changes in the neighborhood. The National Theatre, which premiered Uncle Tom’s Cabin in 1853. Later incarnations of the space included the International Garden Saloon, the National Garden, the Roumanian Opera House (a Yiddish theatre), the Liberty Theatre, the Nickelodeon Theatre (famed for a rowdy amateur night), the Manhattan Music Hall (a notorious den of vice that was shut down by the city) and finally the People’s Music Hall (a Yiddish house). The Bowery Garden Theatre, which produced the city’s first Yiddish shows, was renamed the Oriental Theatre, and finally the New London Theatre. Tony Pastor Opera’s House. Originally the Hoym Theatre, established 1858. Tony Pastor, accounted by some to be the Father of Vaudeville, took the place over in 1865. It later became Miner’s People’s Theatre and later just the People’s Theatre, a Yiddish venue. 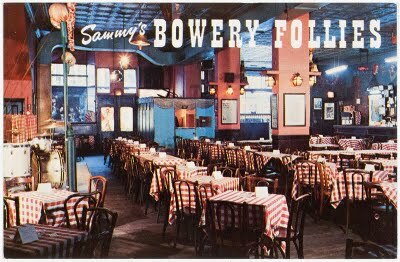 Sammy’s New Bowery Follies, a nostalgic theme bar and tourist attraction with a stage show that evoked the old Bowery of yore. It operated 1934-1970. The Zoological Institute, built in 1833. An indoor menagerie compromising 4 city blocks, its collection included bears, tigers, monkeys, hyenas, snakes, vultures, zebras, rhinos, lions and elephants. The Branch Hotel, where Stephen Foster died. And, while we’re at it, Sasquatch. We didn’t see that either! Stay tuned for more on dime museums, concert saloons, minstrel shows, and variety theatres over the next few days! “There’s still a value in seeing where things were.” I couldn’t agree with you more! What a gift it is to have a great imagination. Thanks for your wonderful blog.